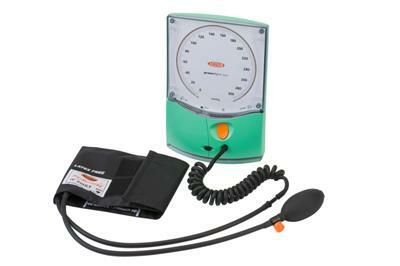 The greenlight 300 is a new type of manual sphygmomanometer that has been developed to provide a reliable and accurate alternative to the mercury sphygmomanometer, the current gold standard in blood pressure measurement. This is achieved by using silicon chip technology to replace the traditional mercury column with an electronic pressure detection system. The greenlight 300 overcomes the problems associated with other types of sphygmomanometer: it is non-toxic and robust and, most importantly, automatically self-calibrates to zero every time it is switched on, thus ensuring reliable accuracy. The greenlight 300 is suitable for use in all patient groups – including the pregnant and elderly – where mercury has been used in the past. The table below summarizes how the greenlight 300 addresses the problems posed by other types of sphygmomanometer. Click on the device type for more detailed information about their associated problems.